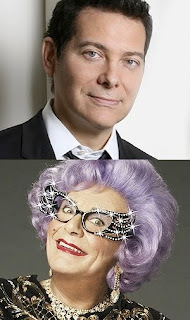 When Dame Edna Everage and Michael Feinstein walked into the journalist-filled private room of the Red Eye Grill for their press conference last night, there was a gasp from the crowd. I’m positive it was due to the hulking presence of Ms. Everage, who appears easily over six-feet tall, and the stark contrast to her companion, the rather diminutive Mr. Feinstein. These two entertainers, varying in many ways than merely the physical, were there to promote their Broadway show, All About Me, which begins previews this Sunday. “I can vouch for that,” Feinstein deadpanned. This mismatched pair—Feinstein, the pianist/cabaret owner/music archivist, and Dame Edna, the cross-dressing alter ego of comedian Barry Humphries—will open a musical-comedy review on March 18, complete with dance numbers and duets at the Henry Miller’s Theatre. It was publicized that the performers had intended on unveiling separate, solo shows this same Broadway season, but decided to join forces due to lack of theater availability. “It’s a journey. It’s also a meditation on loss,” Everage said. “It’s a story of reconciliation of a tall, attractive Australian woman… and a… an American person.” Everage takes another comical swipe at Feinstein (“It’s like a conversation between two people—one of whom is much more interesting than the other”) before admitting that the pair laughs all the way through their rehearsals. I saw Dame Edna in her last Broadway stint in December 2005, during the run of Dame Edna: Back With A Vengeance. She was incredibly engaging then, but ever since All About Me’s announcement, I have been skeptical as to whether her shtick would remain fresh. If it’s any indication, Dame Edna had the entire room of journalists in stitches during the press conference, her almost-animatronic eyes darting back and forth as she slingshot each well-timed quip into the air.